Firstly, huge thanks to everyone who is doing their best to save badgers’ lives. There are just 7 days left till the end of the 6 week cull period. We expect a big push from the cullers to achieve their minimum target of 615 badgers by 14 October. There are rumours that targets may have been reached in Somerset and Gloucestershire, if so there will be even more pressure on Dorset. If you haven’t been able to help so far: Now is the time to get out into the cull zone to protect Dorset’s badgers. There are nightly patrols leaving from Blandford and daytime patrol from Camp Badger. Maps of the routes will be provided and the patrols will be of varying lengths to suit differing requirements. For details of what you are advised to wear and bring please click here. This is a very busy week for us ,we are getting a lot of media attention! You may have seen the articles on our Facebook page. In Saturday’s Dorset Echo there was an article about our National Badger Day patrols. MORE PATROLLERS = MORE BADGERS SAVED! We are getting a steady stream of patrollers out each evening but no great hordes so far. The patrols have been well targeted and are being very effective at disrupting shoots, simply by their presence in the area. On occasions patrollers may have been unaware of the effect they have had and the lives they have saved. The Dorset Badger Vaccination Project was also mentioned in the Echo on Friday, as well as in the double page spread in the Daily Mirror on Saturday. 117 Dorset badgers have been vaccinated this season, many of them from land inside the cull zone. DORSET’S BADGERS NEED YOU TO GET ACTIVE NOW – THEIR LIVES DEPEND ON IT! It’s National Badger day on Tuesday 6 October! Right now beautiful badgers are being shot in Dorset, Somerset and Gloucestershire under the guise of ‘preventing the spread of bovine TB in cattle’. We are making a difference by being out in the cull zones patrolling the footpaths and safeguarding the setts. More patrollers = More badgers’ saved. If you agree that this senseless slaughter of our precious badgers is a cruel, callous and costly distraction: Unite with us and join our peaceful protest walking the public footpaths and rights of way of the North Dorset Cull zone. You’ll be looking for wounded badgers and any other injured wildlife. 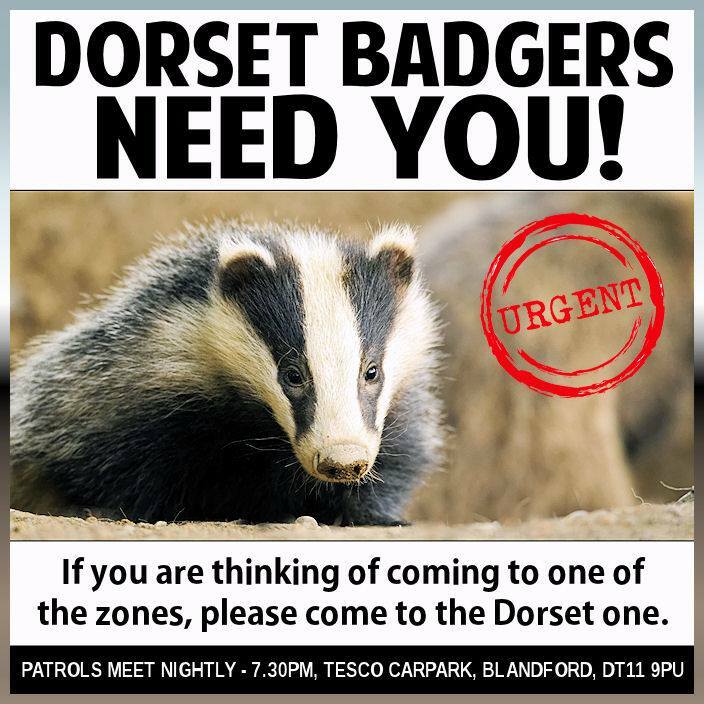 7.30pm at Tescos Car Park in Blandford DT11 9PU (Turn off the Badger Roundabout on the A354) – this is the meet-up point and location for patrols every evening during the cull, so even if you can’t make it on the 6th please come along another evening. The patrol routes will vary in length and each patrol will have a leader with a map of the route and all the tel. contacts needed. The police will be there to ensure that patrollers are not harassed or intimidated by any pro cull supporters. We do not advise the police of the patrol routes, but they will keep a watchful eye on any patrols that have requested their help. They will also respond to any reports of intimidation, abuse or anti social use of vehicles against our Badger Protectors. As we celebrate National Badger Day badgers are being killed in Gloucestershire, Somerset and Dorset in a desperate attempt to reduce the spread of bovine TB despite all the evidence showing us this policy is a disastrous failure on scientific, animal welfare and cost grounds. Badgers are one of our most important native species that have survived in our landscapes despite the constant threat of persecution, destruction of their habitats and death on our roads. It is time we recognised their value and importance to our eco system and celebrated their strength, beauty and resilience in the face of the many threats they encounter every day.